I was born during WWII and lived at my grandparents’ home in Merchantville, NJ. My mother and/or grandparents would visit neighbors with me. It was designed to help me toddle around my new world. I was too young to remember today the first visits to those who lived around 19 W. Walnut Ave. However, as I got older, I recall talking with Mr. Lee. By that time, my father had returned from the South Pacific, and we moved a couple blocks down from my grandparents’ home. I could journey to visit Mr. Lee on my own. Mr. Lee was born in China many decades before. I liked Mr. Lee, because he would tell me about living in China in the late 19th century. In reality, Mr. Lee was my first teacher. I learned a great deal from him. Seventy years later, I can’t recall all his lessons about life. However, I recall one cloudy and cold fall day. Mr. Lee was busy planting daffodil bulbs in his front flower beds of his home. After an hour of watching and talking with Mr. Lee, he finally had completed his task. Then we went to his porch where his taught me about life and the importance he saw in daffodil bulbs. I wasn’t impressed by a bunch of dead and all dried-up bulbs. Nevertheless, it was a teaching moment for Mr. Lee. He said, “Today’s sorrows will give birth to tomorrow’s joys.” Essentially, he taught me about planting bulbs, which do look all dried-up. However, in the spring, they will come alive. I was probably only five at that time. The idea of some dead bulb would flower in the spring seemed impossible. Interestingly, I have spent many fall days planting daffodil bulbs in all the homes in which I have lived. 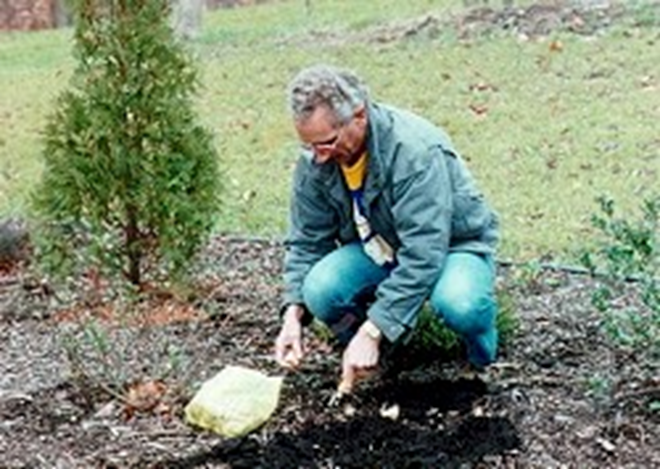 This picture of me plantings daffodil bulbs over 25-years ago. However, that is the backstory. When Jack was around two and a half, I was babysitting for him one day. While he played, I taught an online art history class. He came up to my laptop and asked me what I was looking at on the s creen? I told him a famous painting. That answer satisfied him and off he toddled only to return several minutes later wanting to know what was now on the screen. It was then that it dawned up me that he wanted to learn art history. Today, Jack and Owen, his younger brother, know several dozen painters and many of their paintings. Those two grandchildren can easily identify more paintings than 75% of the adults in America. Then I got the idea that at both Christmas and their birthdays, I would give them paintings that they seemed to enjoy the most from their class with me. In addition, they have not only the paintings, but also letters from the various painters, which include Vincent van Gogh, Claude Monet, Marc Chagall, and El Greco. 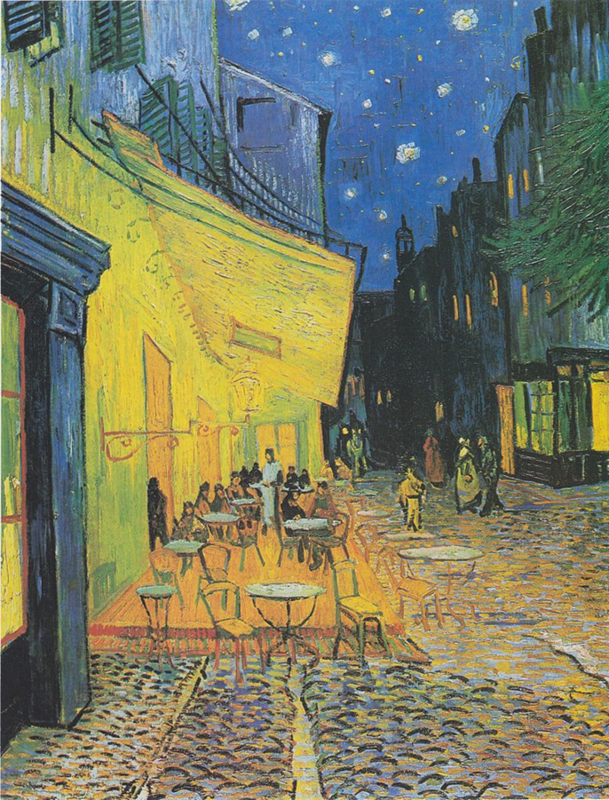 Last on their birthdays in July, I gave Jack van Gogh’s Café Terrace at Night and Owen received van Gogh’s Fields of Tulips with accompanying letters from van Gogh to each of the boys. Then I got an idea about what I learned from Mr. Lee about planting daffodils. In my lifetime, I have planted thousands of daffodil bulbs. Therefore, I thought that I could continue to carry on Mr. Lees lesson to another generation. The problem was that I couldn’t find tulip bulbs since you couldn’t get them in the middle of the summer. Therefore, I googled tulip bulbs. 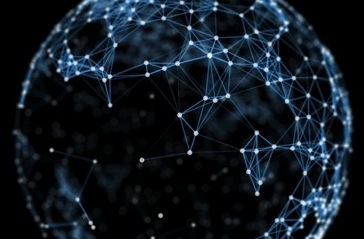 I didn’t have to look for more than a minute scrolling through a few of the 5,700,000 before I found this site. What would cause me to click on this site? West Chester is located a couple dozen miles from Oxford where I spent several weeks each summer down on my cousins’ dairy farm. I would help milk the cows, take the milk to the creamery, and pitch ensilage into the silo as a young child. Therefore, I clicked on Dutch Grown’s tulips page: https://www.dutchgrown.com/collections/tulips?page=1. There were nearly 200 different tulip bulbs from which to choose. Since blue and yellow are my favorite colors and also Jack and Owen’s, it wasn’t long before I called Dutch Grown with an order. The person who answered the phone listened patiently as I explained my dilemma. I told him about teaching my two grandsons art history. I explained to the guy about getting Jack and Owen famous paintings and a letter from the artist. I went on and on with totally unnecessary details and my love for Jack and Owen. I told the voice at the other end that I wanted a handful of yellow tulip bulbs called Golden Parade and the same with a handful of blue bulbs called Blue Aimable. Then Jack and Owen could plant their tulip bulbs this fall. He told me that they would be shipping bulbs from Holland in mid-September. I thanked him and asked him for his name. He said that his name was Ben Rotteveel who happened to be one of the co-owners of Dutch Grown bulb company. I thanked Ben still thinking that he was around my age of 74. As Ben promised the bulbs arrived mid-September. It was Ben’s gift to me for Jack and Owen. Also, it wasn’t a handful of tulip bulbs. Instead, I got a box of 100-bulbs. Ginger noticed that I had gotten a box, which she assumed was for her. 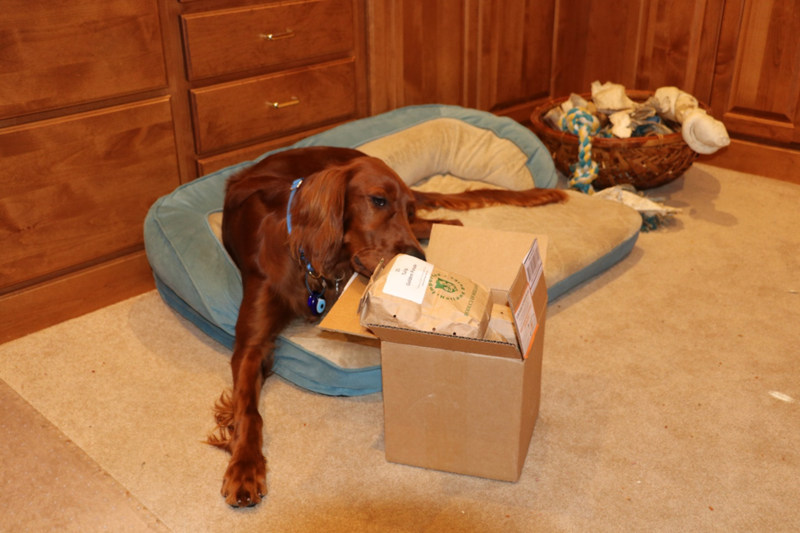 Ginger checked out the contents to determine whether there were any bones or pig ears. As I look back upon that serendipitous event, I remembered about Mr. Lee’s daffodils and how those daffodils informed my life. I also recalled visiting my cousins farm in Oxford. Had it not been for those two unrelated moments, I would have never talked to Ben. I would have gotten several tulip bulbs and given them to the boys. However, Jack and Owen will get 100-bulbs and a story that they will never forget. As I write this essay reflecting upon the happenstance of the past several months, I wonder how Jack and Owen process this story in their twilight years. In the meantime, thanks Ben. You made my day along with Jack and Owen’s. 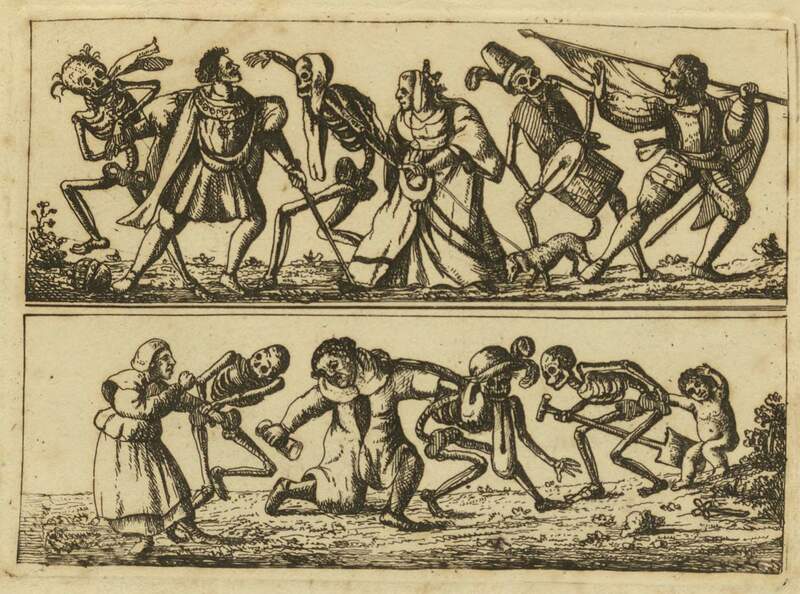 However, that isn’t the ending of this present-day situation. 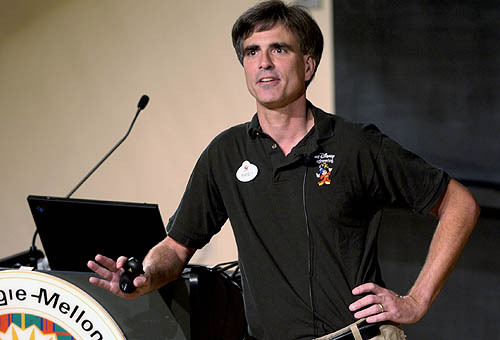 Having done two dances with death and watched Randy Pausch’s Last Lecture dozens and dozensof time, he mentioned being appreciative, “Showing gratitude is one of the simplest yet most powerful things humans can do for each other.” I do appreciate what Ben has done for me. Therefore, the following letter to the editors of the Daily Local News in West Chester. Over seventy years ago, I spent summers on a dairy farm of my cousins, Laura and Ethel Reynolds. From the time that I was a toddler, my family would take me to the farm each summer. When I had my own young family, we would go down to the farm for a visit every summer. Had it not been for my knowledge of the environs of the Reynold’s farm, I would not have known of West Chester. Fortunately, I knew the area quite well and have been back often to the area over many decades. Years ago, people were genuinely interested in helping others. They were honest and caring. Over time, things seem to have changed but not with one of West Chester’s residents and co-owner of Dutch Grown bulb company. This letter is to let some of your readers of the Daily Local News locally and those on the Internet know how understanding and driven Ben Rotteveel was to assist a total stranger. In the middle of the day, Ben received a call from me in which I spent a great deal of time talking about a dilemma that I was facing. I have two young grandchildren, Jack and Owen, who are just beginning school. On their birthdays and Christmas, I get each of them a copy of a famous painting along with letters written by the painter talking about their gift to the boys. 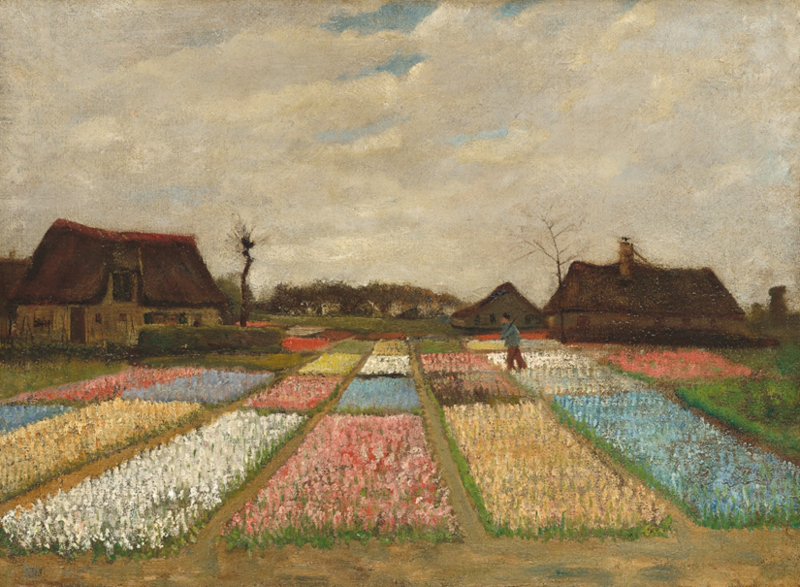 On Owen’s past birthday, he received Tulip Fields by van Gogh with a letter by the painter explaining his painting. 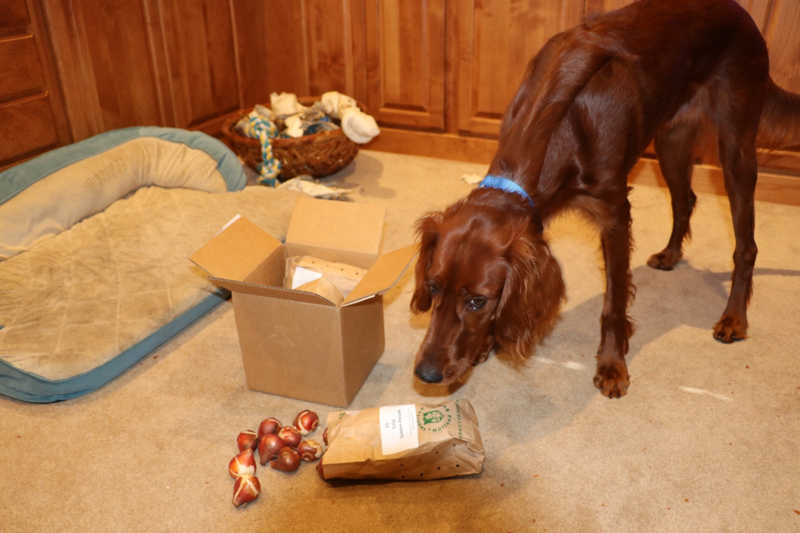 Along with other gifts, I thought that it would be nice to get some tulip bulbs for Owen and Jack for them to plant this fall. However, where can you get tulip bulbs in the middle of the summer? That was why I was talking to Ben. He was as concerned with me desire to get tulip bulbs for my grandsons as was I. I told him I just wanted several yellow and blue blubs. He was excited by my project and promised when the bulbs from van Gogh’s Holland arrived, he would send his gift for the boys. He told me that I would be getting the bulbs around mid-September. Mid-September arrived with what I thought would be a couple of handfuls of bulbs. What I received was a box of 100-tulip bulbs. This letter is to the readers of the Daily Local News. It is my way of expressing my gratitude to Ben.